I recently attended, with our friend The Artist the ten-year celebration of Castello di Amorosa opening. There was too much packed into the event for a single blog post to cover, so this is part two of the three-part series. We were led down into the caves beneath the castle, through narrow winding tunnels, until we emerged into a large hall. 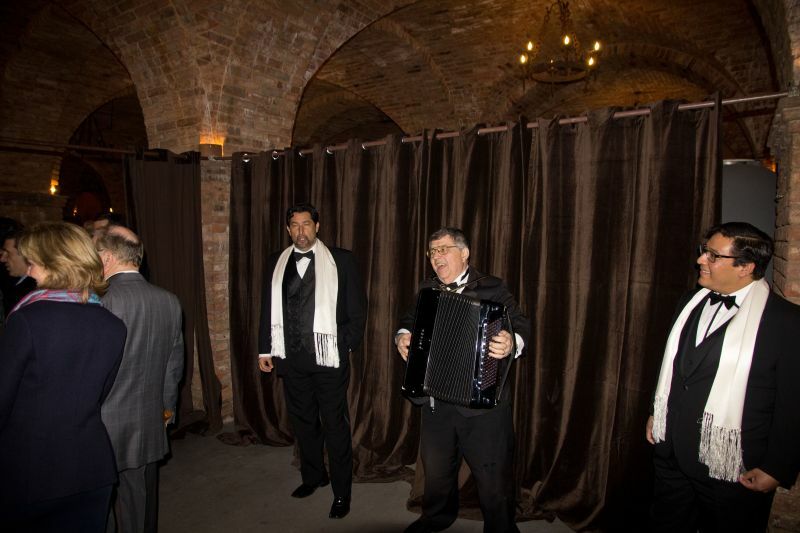 We were met by singers performing an opera aria. Ahead of us was a long table on which hundreds of wine glasses sparkled. That number is not hyperbole, for we were about to do a vertical tasting of ten years of Il Barone, the Castle’s flagship wine. 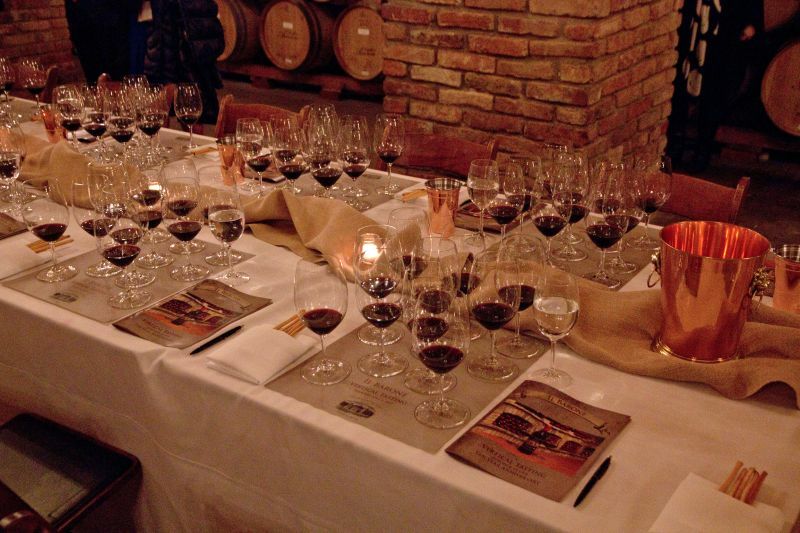 For those unfamiliar with the term; a vertical tasting involves tasting the same wine from different vintages. 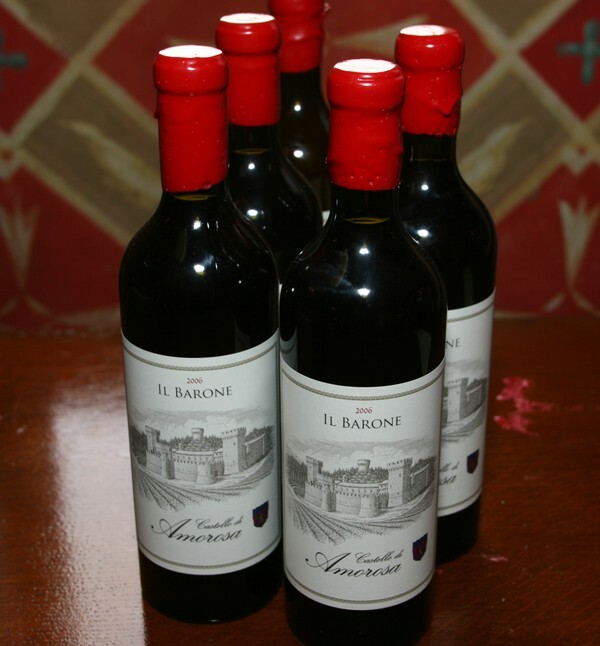 In this case, we had Il Barone from 2003, the first vintage, to 2012. The wine had been poured about three hours before we sat down. The glasses placed on a mat which indicated the vintage in each. There was a background odour of oak from the barrels; not so strong that it would interfere with smelling the wine. Before the tasting started, Dario Sattui described his vision of the wines made at Castello di Amorosa: “Italian style with a Napa twist”. He emphasized that the wines were not tailored to any specific wine critic. Dario then introduced us to the “Mistress of Ceremonies” for the tasting: Karen MacNeil. Karen is the author of The Wine Bible, the best-selling wine book in the United States, and to quote Dario “the only person in the United States to win every major (wine) award in the English language”. Karen offered reflections on the Castle and the unique way in which wine allows us to taste a moment in time. She described Il Barone as a very masculine wine. Having tasted the wines a few week previously, Karen felt that the ten wines naturally divided into three flights, 2003-2007, 2008-2009, and 2010-2012. On that basis rather than taste all ten one after the other, we would drink a flight and then talk about the wine in that group. The 2003 had a nose with blackcurrant and a more dominant sense of leather. The wine had a soft mouthfeel with low to moderate acidity. A sip offered cassis and raspberry. The tannins did not hit me immediately, but crept up and helped hold a good finish. The 2004 had a dramatically different nose; blackcurrant was still present, but the fruit no longer played second fiddle and there was a rich scent of cloves. I preferred the nose on this wine to that from the 2003. Taking a taste revealed a more complex and better-structured wine than the previous year. It seemed to have a slightly higher acidity. The flavour was a mix of raspberry, blackcurrant, and pepper. There was more to the taste than I could identify as it was not merely fruity. The 2005, which Karen describes as being like Clint Eastwood with five-o-clock shadow, offered a sweet nose with blackcurrant present, but in a more restrained fashion than in the previous year. The tannins were more distinct than in either of the earlier vintages. The fourth, and final wine, from this first flight, was the 2006. Here I once more found leather and blackcurrant on the nose with the addition of green pepper. Slightly more acidic than in earlier years, the flavour had raspberry, vanilla, and dark chocolate. The finish exposed sightly more sweetness than was apparent at first. This was my favourite of the first four wines. Karen highlighted the 2003, saying that there is a moment in time when a wine is no longer young, but is not enormously old either. It can be hard to find a wine that is at that point of transition and the 2003 is at that tipping point. The second flight started with the 2007 vintage. The earlier wines had been 100% Cabernet Sauvignion. From this year, Petit Verdot and Merlot were added; creating a natural separation from the first set. The 2007 had a nose that promised little; leather and wet wood dominated. The fruit aromas from previous years were absent. The flavour was complex; green pepper and a hint of cassis combined with moderate acidity and firm tannins to offer a well-balanced nose. This was a wine whose taste was far better than the nose had implied. The fruit in the nose returned with the 2008; blackcurrant joining the leather. The acidity was more distinct than in the 2007. Oddly, the fruit flavours were, despite the aromas, more muted; this tasted savoury with herbal notes and a strong punch from the tannins. The 2009 offered fruit, but this time I did not detect the blackcuarrnt; finding cherry instead which was mixed with vanilla and anise. Taking a sip I found striking, but appealing acidity. There was blackcurrant and raspberry providing the fruit balanced by pepper and espresso. The tannins were surprisingly light. I felt that was the best vintage so far. Karen discussed the challenges of a vertical tasting; the dichotomy of looking for differences between the wines, whilst also looking for the similarities. To quote “You are forced to see differences… you are also trying to see the ribbon that links all these wines”. I was in agreement with this assertion after the first two flights and was even more convinced after the third set, which was dramatically different from what had come before. 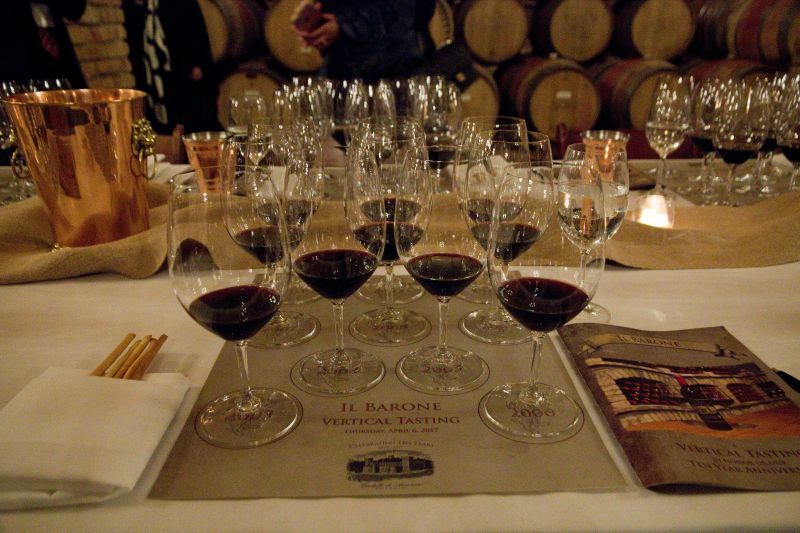 The third flight started with the 2010 Il Barone, which offered a nose that mixed vegetal notes with an odour of a copper penny in a puddle. The mouthfeel was silky smooth and my notes pose the question “Where did (the) tannins go?”, they crept up to help sustain a long finish with raspberry and blackberry. The penultimate Il Barone, the 2011, had a smell of old books, hops, urine, and just a hint of dark chocolate. My notes also state, a little directly; “Yuk”. There were hints of dark fruit, but these were overwhelmed by a tongue curling acidity. This alone of the ten wines was one that I did not enjoy. Karen commented that 2011 was wet and cool and that it had been challenging to harvest. We finished with the 2012, a wine that Karen described as being like a teddy bear; hard not to dislike. The nose was of sweet, very ripe fruit. The moutfeel was of silk, with low tannins and a taste that reminded me of blackberry and bramble apple pie. There was a striking and enjoyable sweetness. It was a wonderful opportunity to taste a fine wine across a decade of its development. I found, as Karen had warned, that it is easier to identify the difference than to recognize the similiarities. The closest I can get to finding that thread linking these ten years of Il Barone is to see that even in the 2012, the fruit is not all that the wine has to offer and that even when fruit was not dominant, it was still a strong element. All of these wines, even the 2011, were complex wines that rewarded thoughtful reflection on how they impacted my senses.